Yes it can. If you are interested to know more, please read on. 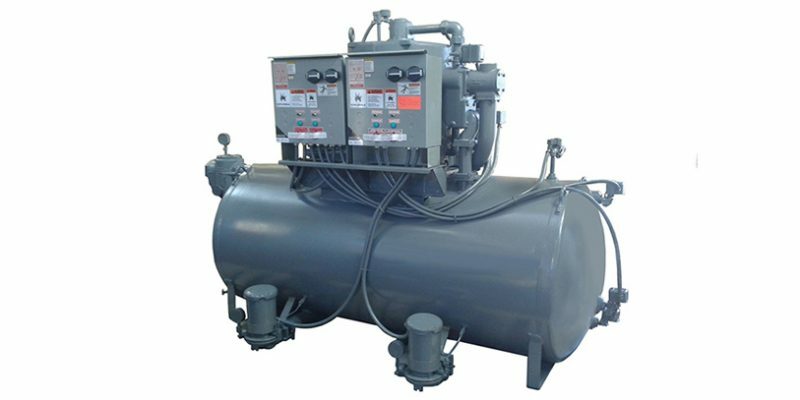 The vacuum units in the Domestic Pump product portfolio include both condensate return and boiler feed units. But, no matter the unit type, the vacuum production part employs the same working principle. 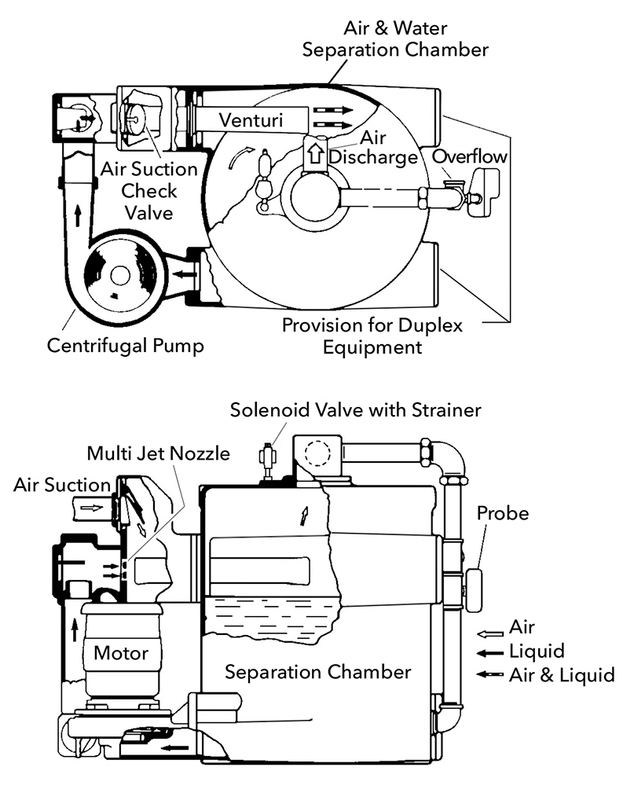 Domestic Pump products use condensate pumps to produce a so-called “liquid jet vacuum,” which works on the basis of Bernoulli’s Principle. This principle states that “pressure head + velocity head + elevation head = constant.” The three main components required for the job here are a centrifugal pump, a multi-jet nozzle and a venturi pipe. Fig. 1 represents a vacuum-producing chamber. I will use it to illustrate the process. The pump delivers a stream of water up through the piping, then horizontally through the nozzle, and then through the venturi pipe. The horizontal direction of the flow means that the change in elevation is negligible here – essentially a constant. Once the water passes through the nozzle, it’s broken into streams and injected into the venturi pipe, which narrows. But water is a non-compressible fluid, so the only way to get it through the narrowing is to accelerate the velocity. Following Bernoulli’s equation, if the elevation stays the same and velocity increases, then the pressure must go down in order for the equation to remain constant. The water, forced at high velocity across the gap between nozzle and venturi, entrains air and gasses through the air suction check valve, which is open at this time, thus lowering the pressure and creating smooth, steady vacuum in the system. Then the mixture of water and air is discharged tangentially through the venturi into the separation chamber. This causes a whirling motion inside the chamber, where the water is forced towards the walls of the vessel, and the lighter air flows to the center and is discharged through the vent of the chamber. An additional benefit of that centrifugal motion is more available pressure at the pump inlet and less pressure resistance at the venturi pipe outlet. The pump will stop once the vacuum set point is reached, and then the air check valve will close in order to separate the system under vacuum from the vented chamber. Finally, the equipment takes a well-deserved rest before starting the next cycle, triggered by a call for duty from the vacuum switch, which is adjusted in the factory based on the application. Most commonly, an average set point of 5.5” Hg vacuum is maintained at 160ºF condensate temperature. This is the ASHRAE recommendation for vacuum heating systems. However, using the described technology, the Domestic Pump MJ clinical and industrial vacuum units are capable of producing vacuums up to 28” of Hg. In this scale, 30” of Hg would be a perfect vacuum. Cycle after cycle, the water in the vented separation chamber will slowly evaporate. That’s why the tank has a water level control. It consists of a level switch (either a float switch or a probe) and a solenoid valve. The switch will follow the water level and will signal the valve to open if the water level gets too low. The solenoid itself is installed on a make-up water supply line, and will let water into the chamber following the signal from the level switch. So, by extracting water from the bottom of the chamber and pumping it though the impeller… out of the pump discharge… through the manifold elbow and a diverter… then into the nozzle… then across a gap to the throat of the venturi… we produce vacuum.